Despite an occasional shot in the arm from the Supreme Court, north India’s ecology has more often been at the losing end of its long-running battle with business interests with eyes on its land and water—and now, even air. Considering that, can a seemingly local uprise by nature lovers last week in the national capital region hope for the best? On the face of it, it couldn’t get more local. A road is proposed to be built cutting through a suburban park in Gurugram on the border with Delhi. Its purpose is to ease the traffic congestion woes on the two crucial highways linking the national capital with its bustling corporate heartland in the suburbs. Environmentalists cry foul that the park and its rich flora and fauna will be ruined if a road runs through it. That’s taking things rather simplistically. 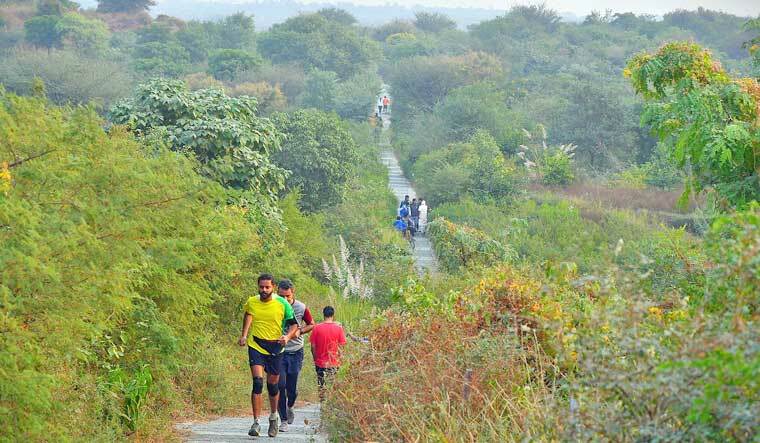 The park, the Aravalli Biodiversity Park, in Gurugram is a forest that was restored over a mining site less than a decade ago, and is a part of the ecologically sensitive Aravalli mountain ranges. The Aravallis, of course, are the low mountain ranges running from Delhi through to Haryana and onward to eastern Rajasthan, and play a significant part in maintaining the climatic and ecological balance of northwestern India in general, and the Delhi NCR in particular. A recent study by the Centre for Environment Research and Education (CERE) estimated that as much as seven per cent of Delhi’s oxygen is generated by the green belt in the Aravallis. It plays a crucial part in rain cloud formation in the region as well as mitigating vehicular pollution. Though many parts of its dry and ragged terrain are protected by the law from construction or other commercial activities, reality has been a bit different. From its southernmost fringes, called the ‘ridge’ within Delhi, to massive swathes through Gurugram and beyond, are all prime land, if only usable. Obviously, encroachment and acquiring patches from it through rewriting of government rule or land use plans have been a regular occurrence over the past few decades. While the rules have been slightly more strict in Delhi, it was virtually a wild west-style gold rush as far as neighbouring Haryana was concerned—especially in Gurugram, where land prices and real estate activities have been at an all-time high in the last two decades—that may lead to disastrous consequences for the sensitive ecology of the Aravallis. This is exactly why the move to pave a road through the ‘forest’ has touched a raw nerve. As the news broke out last week that the Gurugram Metropolitan Development Authority (GMDA) and the National Highways Authority (NHAI) were planning a multi-lane highway through the park, a not-so-minor social media storm ensued. Hashtags like ‘Save Aravalli’ and ‘Nahi to NHAI’ were soon trending. Hundreds gathered for a protest march on last Sunday at the park, while IamGurgaon, the NGO that partnered in conceptualising the park, said that their petition against the road had garnered more than 20,000 signatures so far. Chetna, another NGO, said they will approach the court against the project. “The thought process (with government and business) seems to be that the Aravallis are a resource to be consumed, not to be celebrated or protected as an environment zone,” alleges Chetan Agarwal, an independent environment consultant. While court crackdowns have limited mining in the area effectively, real estate development is a different story altogether. The 'Gurgaon' boom of the last two decades has begun to plateau and there is a need for fresh tracts of land to scale up. And the only space left? The Aravallis. Recently, the National Green Tribunal had criticised a Haryana plan for a road alignment which was reworked to go right through the Aravallis. Even though the government backtracked, nature lovers are concerned. “My sense is that there is a broader plan to put up roads in undeveloped areas (so that) they get accessible and then (the real estate developers) can develop them slowly,” adds Chetan. The park spans about 382 acres in the heart of Gurugram, and is surrounded by building projects that are itching, and inching towards this remaining prime piece of estate. Is that the real purpose of the road? For, as Agarwal points out, the congestion on the highways linking Delhi and Gurugram can be easily solved by better alignments of the road, as well as earlier proposals like creating a ‘bypass’ link through Dwarka Expressway for traffic going beyond Gurugram to avoid passing through the fast-expanding city. Protesters gathered at the park on Sunday morning, second Sunday in a row, putting up posters and asking the government to re-consider the project. Pictures of the park before it was restored by IamGurgaon from a mining site into a flora and fauna rich oasis in the middle of the concrete jungle were displayed. The online campaign is also gaining steam, while IamGurgaon representatives have sought out an appointment with Haryana Chief Minister Manohar Lal Khattar, as well as knocking on the doors of the Union ministry of environment and forests. The massive reaction to the proposal has put the authorities on the back foot for now, with GMDA quickly clarifying that the road will be reworked to pass only through a corner of the park and will not spoil it. 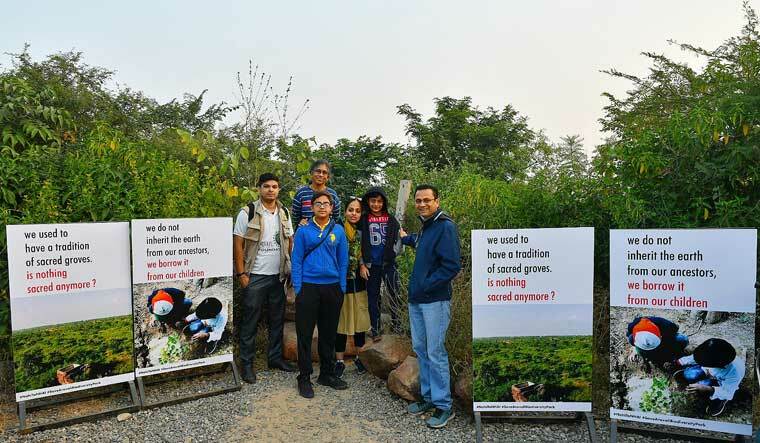 “But that is the best part of the park where you have better biodiversity and is a better habitat for wildlife,” argues Vijay Dhasmana, renowned naturalist who was involved with curating and overseeing the restoration of the forest. As he quips, the authorities have not backtracked, only ‘side tracked’ for the time being. It’s going to be a long road ahead.